In most Asian countries for thousands of years, Bamboo has been used for making everything from kitchenware to buildings while this invaluable resource has remained largely untapped in the west. based textile. 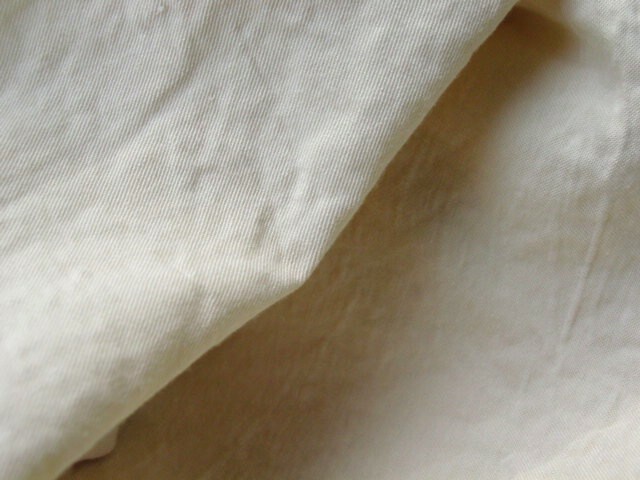 Bamboo fabric is environmentally friendly compared to cotton yet they are similar materials. Bamboo fiber is a highly water absorbent fabric, is cool in hot climates, draws moisture away from the skin, and acts as a good insulator in cold conditions, it is an all round versatile fabric that comes from the unlikely source , a plant as durable as bamboo. Bamboo towels are organic as they are grown without the use of pesticides and herbicides;is naturally antibacterial & hypoallergenic; Bamboo towels are quick to absorb moisture,& dry twice as fast as cotton. 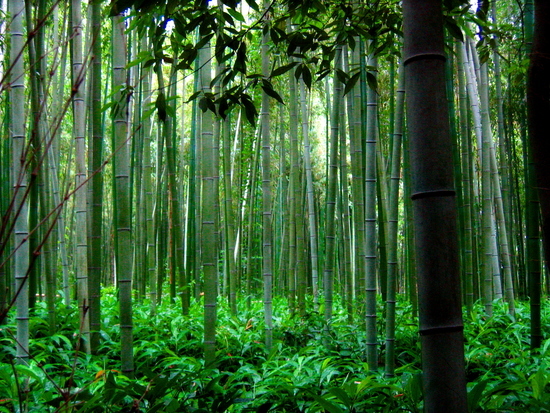 Bamboo is a sustainable resource, & their plants produce more oxygen than trees. water pipes, clothing, food source, gates, houses, gazebos, windbreaks, flood and erosion control, handles for tools, plywood panels, ladders, fruit pickers, paper, alcohol, boats, bridges, tools,medicines, privacy screens, window blinds, plant pots, poles, stakes, scaffolding, decorative screens, bumper bars, & so on & so on. Bamboo is a member of the grass family and can be found growing north to south in Australia. So hearty a plant that it can even be grown in the snow. 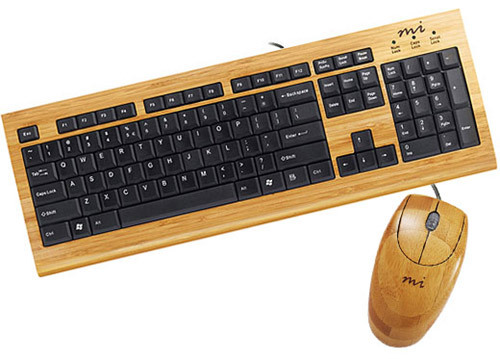 There are two types of bamboo – monopodial, or running bamboo, and sympodial, or clumping bamboo. This species does not usually require pesticides or fertilisers & grows well without aid. A sympodial bamboo, a bamboo recommended for the garden has a main branch, with two secondary branches on either side. However, Monopodial bamboo is difficult to maintain, grows unchecked and is largely responsible for bamboo’s bad reputation. As such this species should be avoided. Bamboo types can be differentiated by their branches. Planting a bamboo in the ground requires minimal soil preparation, growing best in well drained clay soil with running water moving past the roots, but not sitting around it. Over watering the plant will kill it. Some examples of popular bamboos include the garden variety Buddha Belly Bambusa, Tre Gai which has a 3″ Diameter and is a Structural Bamboo used in housing. Another type and the most popular is Timor Black a cosmetic Bamboo found in most gardens. 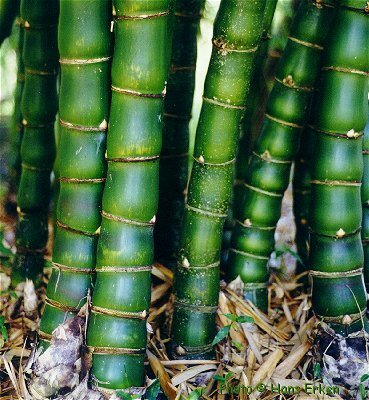 Most bamboos provide edible bamboo shoots as a supplement vegetable all year round. Incredibly versatile it can be put to use in a variety of ways – as a screening plant, or a windbreak to beautify a garden; a building material to provide shelter and housing, as a fabric for clothing, the diversity of use and species available encourages cross-breeding and avoids monoculture problems. The clumping varieties, the most manageable & hence more popular, can be grown in the ground, or in a pot as a feature plant & can be used to beautify or protect in a utilitarian or cosmetic use. Culturally a bamboo grove is said to be the dwelling place of the Lord Buddha & is a sacred space for peace and tranquility. Found in most gardens are: Bambusa vulgaris ‘Wamin’, commonly known as Buddha’s belly – after the shape of its inter-nodes. This variety is a clumping bamboo best used as an ornamental feature plant after 5 to 7 years it will only be about 2 to 3 meters wide & 3 to 4 metres tall. Bambusa lako, called Timor black because of its black stems & green stripe on the mature clumps or stems is a bamboo from East Timor. It emerges green and as it ages turns black with green stripes. Bamboo’s rotation & output of annual produce outstrips any other naturally grown resource, even timber, which boasts the most accessible & reclaimable of all building supply. As an economic building material, If today you plant three or four structural bamboo plants, then in 4 or 5 years you will have mature clumps, & in 8 years you will have enough material to build a comfortable, low-cost house. Here is an example of a simple but effective joinery system developed by Marcelo Villegas.. The bronze washers are also available in aluminum or steel. covered with a mowable lawn. Below is a woven Bamboo house module designed by Danish architect Søren Korsgaard. 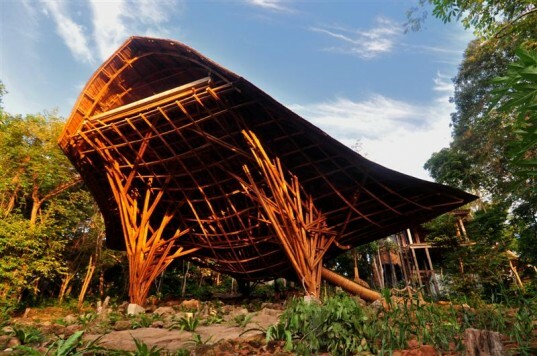 Using the unique flexibility and strength of bamboo, sophisticated weaving techniques have been developed among the myriad of other beautiful methods for treating bamboo, and in a much larger scale this woven bamboo house takes this tradition and applies it to modern architecture. Walls, floors and ceiling seamlessly ebb & flow together in one continuous surface, that also can be shaped into sitting areas and shelves, allowing for a dynamic and unique architectural experience.